Spielberg the Clear Favorite to Win best Director. American filmmaker Steven Spielberg is clear favorite among the public to win the best director award for his film about President Abraham Lincoln at the Academy Awards this year, a Reuters poll showed on Wednesday. While the race to win best film at the February 24 ceremony was shaken up by “Argo” stealing the thunder of “Lincoln” at two award ceremonies last weekend, the best director statuette was deemed destined for one man. Filmed on Szeroka in Kazimierz, Krakow. Spielberg, 66, who has been nominated seven times for best director at the Oscars and won twice – for the World War Two dramas “Schindler’s List” in 1993 and “Saving Private Ryan” in 1998 – was seen as far ahead in the all-male field of five. A Reuters Ipsos poll of 1,641 Americans found 41 percent thought Spielberg should win and 38 percent said he was most likely to win for his U.S. Civil War-era drama in which British actor Daniel Day-Lewis plays Lincoln. Almost half of the respondents to the survey conducted Friday through Tuesday were unsure who should or was most likely to be voted best director. The accuracy of the poll uses a statistical measure called a “credibility interval” and is precise to within 2.8 percentage points. The online poll comes before the Directors Guild of America awards on Saturday in Los Angeles. Since 1948, there have been only six occasions where the winner of the DGA Award for Feature Film has not gone on to win the Oscar for best director. But this year, the Academy of Motion Picture Arts and Sciences, whose members choose Oscar winners, overlooked the directors of four of the year’s biggest movies – Ben Affleck (“Argo”), Kathryn Bigelow (“Zero Dark Thirty”), Quentin Tarantino (“Django Unchained”) and Tom Hopper (“Les Miserables”) – opening the possibility of a rare split in February in the best film and best director categories. Over half a million people in England and Wales speak Polish, data from the UK 2011 Census reveals. Since the UK opened its borders in 2004 to Poles and other new EU members from central and eastern Europe, more people speak Polish in Britain than Punjabi, Urdu, Bengali and Gujarati, Arabic, French, Chinese and Portuguese. In the British 2011 Census, a total of 546,000 people in England and Wales said Polish was their “main” language. Ealing, in west London – the traditional base for Poles ever since WW II – is Britain’s Polish-speaking hot spot, reports the Guardian newspaper. The census data shows that Poles are now the second largest group in the UK to be born abroad, behind Indians but ahead of those born in Pakistan, Ireland, Germany, Bangladesh, Nigeria, South Africa, US and Jamaica. KRAKOW TOURS: A debate on the life of Captain Witold Pilecki, known as the only man who volunteered to be captured and imprisoned in Auschwitz, attracted several hundred people to the Holocaust Memorial Museum in Washington, Sunday. For many of the attendees this was the first time they had heard about Pilecki, who was described, at the debate to mark International Holocaust Remembrance Day on 27 January, by the Polish Ambassador to the US, Ryszard Schnepf, as a “diamond among Poland’s heroes”, the PAP news agency reports. The debate was prompted by the publication in the United States of Pilecki’s original 1945 Auschwitz Report, a 400-page book is entitled, The Auschwitz Volunteer: Beyond Bravery. The book has an introduction by renowned British historian Norman Davies and a foreword by Michael Schudrich, Chief Rabbi of Poland. Professor Timothy Snyder of Yale University, one of the speakers at the debate, recalled that during his three years in Auschwitz during WW II Nazi-occupied Poland , Witold Pilecki tried to organize an insurrection in the camp and managed to send reports on the situation in the camp, the transports of Jews and Nazi genocide. In 1943, having escaped from Auschwitz, Pilecki reached Warsaw, and later fought in the Warsaw Rising and went to Italy to join the Second Polish Corps. In October 1945 he was sent by the Polish intelligence back to Poland but was captured by the communists, accused of spying and executed in 1948. In January, an area in Warsaw’s prestigious Powazki Military Cemetery was dug up in an attempt to locate Pilecki’s remains, the whereabouts of which have remained unknown since his death. Snyder recalled at the debate in Washington the war-time heroism of another Pole, Jan Karski, who was voluntarily smuggled into the Jewish Ghetto in Warsaw to gather evidence on the plight of Polish Jews. “These men should be honoured,” he said. The debate at the Holocaust Museum was co-organized by the Polish Embassy in Washington. via BBC News – Warsaw Ghetto: The story of its secret archive. The mountainous landscape of Poland is ideal for skiers and snowboarders. In the south of our country there are several dozen resorts, some with a long tradition, some newly opened. The better known ski slopes are in Zakopane, of course. The longest one in the Tatry leads from the mountain revered by Polish skiers – Kasprowy Peak, to the Gąsienicowa Meadow – and is over 7 km long. The routes from Nosal and Gubalowka are also very popular, with the Szymoszkowa Clearing the favourite place for the snowboarders. Snowboarders have not been forgotten in Witow and Bialka Tatrzanska near Zakopane, where special slopes for hurdling and tricks have been prepared. In Sudety the piste near Karpacz and Szklarska Poreba are the most crowded. The most famous Polish cross-country skiing piste is in Jakuszyce, where the biggest winter international event takes place – the Piast Race. The Beskidy Mountains resorts have modern facilities and are competition for the foreign resorts – the equipment of the skiing resorts in Jaworzyna Krynicka or in Wierchomla matches any on the best European slopes. The Jaworzyna Mountains have modern gondolas and the longest lit route, 2,5 km. Wisła, Szczyrk and Korbielow also have their faithful fans. In the past few years, due to the increasing popularity of winter sports new piste have been created in Mazury, Podlasie and Kaszuby regions, as well as the artificial slopes which have been created in the Szczesliwice park in Warsaw and the Malta park in Poznan. The route in Polanczyk, by the Solinski Bay, on the Sosna clearing by the shore of the Czorsztynskie Lake and the Lysa Mountain in Sopot are worth recommending to those who like to ski in surroundings with beautiful views. Perhaps the slope in Sopot is not very impressive from the point of view of altitude but it does give a rather unique experience, a view of the Baltic Sea whilst you ski! 27th January 2013 marked 68 years since the liberation of the Nazi German concentration and extermination camp of Auschwitz. The President of the Republic of Poland, Bronisław Komorowski, assumed honorary patronage over the anniversary ceremony. The event was attended by the former prisoners and liberators of Auschwitz, representatives of the governments and parliaments of Poland and Russia, ambassadors and diplomats from over 20 countries, representatives of the clergy, regional authorities, local governments, institutions and civil society organisations, as well as all those who wished to honour the memory of the victims of Nazi Germany. via Auschwitz-Birkenau – 68th anniversary of the liberation of Auschwitz. KRAKOW TOURS: Holocaust survivors, politicians and dignitaries are taking part, Sunday, in ceremonies marking the 68th anniversary of the Liberation of the Nazi Death Camp at Auschwitz. The invited guests, including Russian Parliament’s chairman Sergey Naryshkin, Polish Culture Minister Bogdan Zdrojewski, former prisoners, clergy and politicians from various countries, are marking the day the camp, located in southern Poland, was liberated by Soviet troops, after around 1.1 million died there at the hands of the occupying German Nazis, most of them Jews, but also Poles, Roma Gypsies, political prisoners and others. In 2005, the UN General Assembly declared 27 January, the anniversary of the liberation of the Auschwitz-Birkenau death camp, as International Holocaust Remembrance Day. Ceremonies began in the morning on Sunday with a Holy Mass for the victims and survivors of the Holocaust, celebrated at the Church of Divine Mercy, located near the former Auschwitz I camp., with the main ceremony commemorating Holocaust victims taking place at the Monument to the Victims in Birkenau in the afternoon. “This image highlights, on the one hand, the joy of the end of the camp ordeal, and yet the unimaginable toll of the camp experiences that the liberated will have to carry with them until the end of their days,” says director of the Auschwitz Museum, Piotr Cywiński. As part of this year’s commemorations, a new Russian exhibition is opening in block 14, prepared by the Central Museum of the Great Patriotic War in Moscow. “People survived and gave testimony. Today, thanks to their words and also to the original extant remains of the camp space, we remember and we try to understand. The knowledge we have obtained imposes a fearful obligation on us,” Piotr Cywiński writes in the 2012 Auschwitz Memorial and Museum summary report, which was published on Friday. “We must clearly say, to generation after generation, and say it again: with courage, each individual can help ensure that racism and anti-Semitism have no chance,” Merkel added. A HOLOCAUST evacuee has received proof that his parents were murdered at Auschwitz after a photograph of their battered suitcase was sent to him by a Polish tourist. Harry Grenville and his sister Hannah were among 10,000 Jewish children sent to Britain from Nazi Germany as part of the Kindertransport refugee mission on the eve of the Second World War. Their parents, Jacob and Klara Greilsamer, and grandmother, Sara Ottenheimer, were sent to an internment camp in Czechoslovakia. Mr Grenville received brief correspondence from the Red Cross about his family until a chilling message in 1944 said they were being sent “east”. He was 18 at the time and suspected this meant to a concentration camp in Poland. He never heard from them again. Mr Grenville, 87, born Heinz Greilsamer, had confirmation of their deaths at the end of the war. But for nearly 70 years he has been haunted by not knowing when or where they died. Now Mr Grenville, of Dorchester, Dorset, has been sent a picture of the suitcase which for years was an exhibit at the Auschwitz Museum. It clearly shows the name Jacob Greilsamer. It was taken by a Polish visitor who researched the name and got in touch with Mr Grenville through a history society near his former home of Ludwigsburg, near Stuttgart. Last night Mr Grenville, said: “Out of the blue a photograph turned up of a whole lot of suitcases of victims. “They have the names of the victims painted on them and low and behold, there on this photograph is my father’s name. My heart missed several beats when I saw it for the first time. This is the first evidence I have ever had that my mother, my father and my grandmother arrived at Auschwitz. Mr Grenville and his sister, now 83, lived with a foster family in Cornwall. He volunteered to join the British Army and then worked as a biology teacher, marrying his late wife Helen in 1950.
via At last, after 70 years…proof my parents died at Auschwitz | UK | Express.co.uk – Home of the Daily and Sunday Express. PHIL Clark’s first visit to Poland was in 2007 to watch a friend’s son canoeing for Great Britain. It was there that he met his wife Marta and, 37 trips and two years later, the couple got married. The former Manor Junior School and Helsby Grammar School pupil helped 35 friends and family make the journey for the wedding, which inspired him to set up his own tour company. He said: “I arranged most of their flights, hotels, gave them walking tours of Krakow, took them to Auschwitz and the Wieliczka salt mine and arranged all their transport. Many of them suggested that as everything had worked so well for their week in Krakow, I should look to set up a business doing the same for other tourists and that’s how the idea of Krakow Tours was born. “Having been on a tour of Auschwitz, with a museum guide on a couple of occasions, I knew it wasn’t the best way to see the museum. “Their tours of Birkenau are cursory to say the least, so I set about learning as much as I could about the camps with a view to being able to give a more in-depth visit to my guests. My tours today allow guests to visit the museum without a guide, I then show them around the best preserved parts of Birkenau, and also other sites in the area not covered by any other tour company. “It’s now approaching three years since I started the tours and, in that time, I have take more than 3,200 people to Auschwitz, from 45 different countries. One such survivor was the now late Kazimierz Smolen, former director and co-founder of The Auschwitz-Birkenau museum. He died, aged 91, on January 27 last year, the 67th anniversary of the Liberation of Auschwitz. Another was Stella Muller-Madej, author of the book A Girl from Schindler’s List. The vast majority of Phil’s guests are individual tourists, though he and his two employees do arrange tours for larger groups including schools, older students and adult learning organisations. Neil Benson, of Gresford, visited Krakow last October with his wife Jo. He said: “Being on the very spot where the worst atrocities in history happened is a bit overwhelming, and we were still absorbing it all several weeks later. Phil divides visitors to Auschwitz into two categories – large tourist groups who rush around the museum, seeing half of what is available, and those with more than a passing interest in the history of the Nazi camp..
Phil said: “Many people have been with me to Auschwitz twice and two people have been three times. via Frodsham’s Phil Clark offers insight into Holocaust history – Chester Chronicle. KRAKOW TOURS: Today it has been announced that Sting will headline the ‘Festival of Life’ concerts at Oswiecim this year. 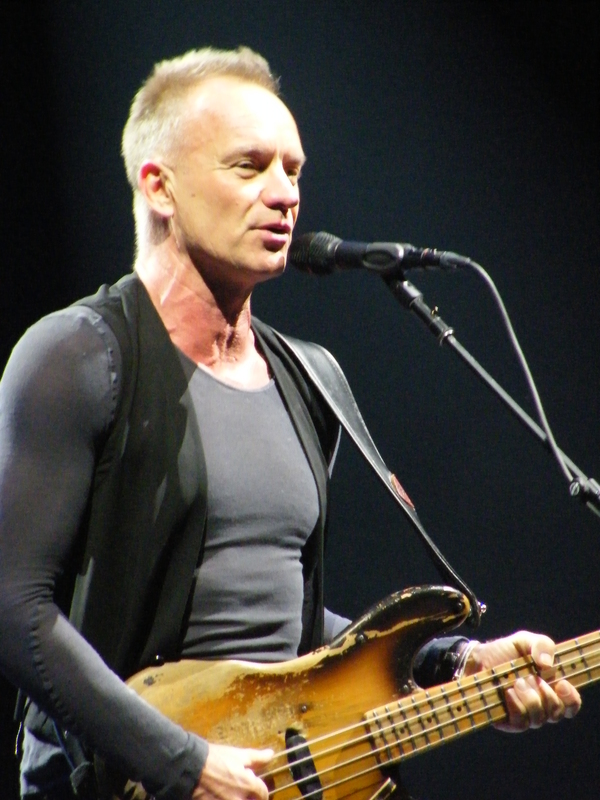 Sting will perform his ‘Back to Bass’ tour on June 29th, the final day of the 3 day music festival. Having seen the tour in Lodz in 2012 I can definitely recommend you try to see it. He will be accompanied by: his longtime guitarist Dominic Miller, drummer Vinnie Colaiuta, keyboardist David Sancious, violinist Peter Tickell and singer Jo Lawry. As a result of the massive impact that the Irish fans had during their visit to Poland for the Euro 2012 tournament, there will be plenty of friendly matches between the 2 countries over the next few years. The first of these is on 6th February in Ireland. At Krakow Tours we will try to keep you up to date with all the news of this and future fixtures. Norwich City winger Anthony Pilkington is one of five uncapped players in the Republic of Ireland’s provisional squad for the 6 February game with Poland. The maiden call-up is recognition for Pilkington who has impressed for his club over the past two seasons. West Ham keeper Stephen Henderson and Derby trio Richard Keogh, Jeff Hendrick and Conor Sammon are the others hoping to win first caps. Giovanni Trapattoni has named a largely inexperienced squad for the friendly. Aston Villa defender Richard Dunne has been included, but a final decision on his availability will be made closer to the match as he has not played this season because of groin and hip problems. The Republic manager was not at the planned squad announcement in Dublin on Monday following the death of his 81-year-old sister Romilde. “I have decided to use this friendly game as an opportunity to work with younger players to see their potential,” said Trapattoni through an FAI media release. “We saw a number of strong performances from our younger players in the second half of last year and we intend to build from those strong foundations. There is still plenty of experience in the squad with the likes of Dunne, Sunderland defender John O’Shea and Wolves striker Kevin Doyle, but there is no place for record cap holder Shay Given. The Villa keeper, who retired after winning the last of his 125 caps in last summer’s European Championships, has had a change of heart due to his lack of club action but is still struggling with a hamstring injury. Given could well return for the World Cup qualifying double header against Sweden and Austria in March, which is likely to prove crucial for the Republic’s chances of making the finals in Brazil. Provisional Repubic of Ireland squad: Westwood (Sunderland), Forde (Millwall), Henderson (West Ham), Coleman (Everton), O’Shea (Sunderland), O’Dea (Toronto), McShane (Hull), Ward (Wolves), Clark (Aston Villa), Dunne (Aston Villa), Keogh (Derby), Cunningham (Bristol City), Pilkington (Norwich), Hendrick (Derby), McCarthy (Wigan), Meyler (Hull), Whelan (Stoke), Keogh (Millwall), McGeady (Spartak Moscow), McClean (Sunderland), Brady (Hull), Hoolahan (Norwich), Doyle (Wolves), Cox (Nottm Forest), Walters (Stoke), Long (West Brom), Sammon (Derby). 2013 marks the 20th Anniversary of Steven Spielberg’s Oscar winning film Schindler’s List, and Universal is acknowledging the milestone by giving the film a Blu-ray release with a 20th Anniversary Limited Edition. Set to arrive in March, the Blu-ray Combo Pack will include the film on Blu-ray and DVD as well a digital copy and UltraViolet. Directed by Spielberg, the 1993 black-and-white drama is based on Thomas Keneally’s novel Schindler’s Ark and stars Liam Neeson as the title character Oskar Schindler, a Catholic man and member of the Nazi party who puts his life and career on the line by employing 1,100 Jews in his factory during the Holocaust. Also among the cast are Ben Kingsley, playing Schindler’s accountant, and Ralph Fiennes, who played a cruel Nazi commander. For its Blu-ray release, the film has been “meticulously restored from the original film negative in pristine high definition, supervised by Steven Spielberg.” Bonus features include “Voices from the List,” a documentary that includes testimonies from Holocaust survivors. And also “USC ShoahFoundation Story with Steven Spielberg,” which focuses on how Spielberg was inspired by the film to start the USC Shoah Foundation, an institute for visual history and education. It’s hard to believe the film is turning twenty this year. Given the anniversary, the timing seems right for the movie to make its Blu-ray debut, and for the film to get touched up for high def. It’s certainly one of the more moving historical pictures in movie history and well worth owning. Universal has the release date for Schindler’s List 20th Anniversary Limited Edition set for March 5, 2013. Below is a look at the box art for the set. Leon Leyson, the youngest among the 1,100 Jews saved by German industrialist Oskar Schindler during World War II, died over the weekend at his southern California home. He was 83 years old. His daughter told the Los Angeles Times that her father passed away after a four-year battle with lymphoma. Schindler saved Jews by telling SS officers that they were his employees and necessary for his factories. He called Leyson “the Little Leyson” because the boy, who went to work in Schindler’s factory at age 13, needed to stand on boxes to work the machinery. Leyson’s mother and brothers were also saved by Schindler, who died in 1974 and was buried in Jerusalem. He was named as Righteous Among the Nations by Yad Vashem in 1993.